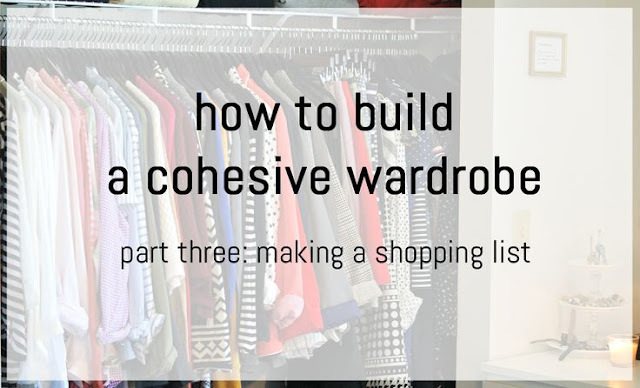 So now that we've cleaned out our closets, and thought about what we want our future wardrobes to look like, it's time to figure out what pieces we want to add back in. Figuring out what you want is pretty easy, it just takes a long time to find it all! Here are a few ways to break it down. When I first started my a clothing budget (because I was a chronic over-spender and under-saver), my montly budget was $150. I set that number because it was around 9% of my income, which I had read is about the percent you should spend on clothes (and because I'm a lemming, I follow what the internet says). Once I started school, and therefore getting a lump sum twice a year instead of getting a paycheck every two weeks, I took a portion of my loan check and put it into a separate savings account that was only used for clothing, and that was the only money I allowed myself to use for clothes. I set my quarter budget at $500. While my clothing budget now comes out of my blog income rather than my student loans, I still stick to that $500 because it's affordable for my current lifestyle and how I like to buy clothes. Setting a budget is extremely personal, and I know many people shy away from discussing the financials side of things on blogs. I like to tell you guys what I buy every month (this month's post coming Monday!) because it very much holds me accountable to sticking to my budget, and I think it's interesting to go back and see how my shopping and clothing choices have evolved. Having a budget, in the long run, has prevented me from buying a ton of clothes that I don't really like. Knowing I have a finite amount of money I can spend makes me think twice about keeping something that I order in the mail, because once I reach my limit, I can't buy something I may like more. It means that over the last two years or so, there are very few things I have purchased that I don't wear on a regular basis. So figure out your budget. If you are just starting to figure out your own style and what you want in your closet, remember that this is a long process. I'm still working on finding "staples" for my closet. If you pretty much have it all figured out, then 1. I'm jealous and 2. your budget needs may be a lot different. Maybe you'll only need a one time shopping budget, instead of a monthly one. Either way, look at your financial situation and figure out a number that works for you. I personally really like having a quarter system because I can spend a lot in one month (like I did this month) and be fine spending less during the next two months (when my surgery rotation will probably steal any will to shop anyway). Take a look at your inspiration pictures, and look for repeating pieces. Do you have several cardigans in them? Are black pants a common theme between pictures? What colors do you gravitate towards? Think about when you did your closet clean out - what were pieces you loved and why (longer sleeves, fun hemlines, sturdy construction, a color that looks great on you?). These, and similar, are pieces that will probably end up being staples for your closet. Staples are so different for anyone, so I can't tell you what your staples will be. Mine are black pants (both dress pants and skinny jeans), longer silky tops, cardigans, fit and flare dresses, and pop-over tops. For you it may be flared pants, crop tops, pencil skirts, or midi skirts. Think about your lifestyle, and your body, and figure out what would work best for both. Try to be as specific as you can about what you want. For example, cardigans are a staple for me. I want ones that go down to the top of my pants, and don't have pockets. There are so many different types of cardigans (or pants or shirts or jeans) that being more specific will help when you go shopping - it cuts out a large part of each store, and stops you from trying out a bunch of styles you may not specifically be looking for. For example, I'm currently looking for a grey cardigan. By knowing what I want, I was only left with several options of cardigans. I just ordered this one from J.Crew Factory that I'm hoping will be exactly what I'm looking for. Again look at your inspiration pictures, and overall the kind of looks you are drawn to, and look for repeating ideas. Also remember what you chose as your leathers, and then figure out what kind of items you need to complete these looks. For me, I figured out a few years ago that I really loved how cognac leather looked (after I feel in love with the Madewell transport tote). So accessories that were really going to complete outfits were other leather pieces that went well together - my Banana Republic flats, Frye boots, and a few belts. My other leather color was black, so over the years I purchased flats with gold hardware, a black purse for work and for play, and a belt also with gold hardware. For me, having matching leathers makes it easier to put together outfits since half the outfit is already done for me. My accessory staples may be completely different from yours. Ballet flats are a staple for me - for you, peep toe heels (like these options) may be something you get a ton of wear out of. I love big scarves, you may have no need for them in Arizona or some equally warm scarf. I find having a few staple accessories makes getting dressed so much easier - they are pieces that go with many items in your closet, items that make your outfits look more pulled together, and are items you'll reach for again and again. keep track of the "holes in your closet"
Write down your staples so you can see them in front of you. Keep a notepad by your closet, so when you are getting dressed and saying to yourself "I would really love a navy blazer to complete this, and many other outfits", you can add that to your list. Having a "holes in your closet" list when you go shopping will keep you on track towards building a cohesive wardrobe.